Join Dave Ratner on Friday, April 5th, from 10am-12pm at the Carbondale Branch Library for "When Art Meets Law - Navigating Copyrights & Contracts for Creatives". Dave will be leading a discussion copyrighting, licensing, contracts, agreements and maintaining a creative business. This event is free and all are welcome! Click Here to get more information! Art + Law: Greeley is a full day of legal workshops for attorneys, creative professionals and arts organizations that takes place on Tuesday, April 16 at Mirage Productions. 10:00 - 11:30: What You Need to Know About Counseling Creatives. Creative Law Network’s Dave Ratner and Erickson Kernell IP’s Dave Rein will cover the common legal issues that creative professionals and entities encounter including intellectual property, contracts, business entity types and much more. 4:00 Casual Mixer - Everyone is welcome! To learn more and register for your spot: Click Here! Today’s Client Spotlight features spoken word poet, Andrea Gibson! Beginning February 25, 2019, Andrea Gibson is touring on their new book, “Lord of the Butterflies”. Click Here for more information on Andrea Gibson and to find a tour date near you. We are excited to announce that Dave Ratner has been named a 5280 Top Lawyer for 2019! Dave has been recognized a 5280 Top Lawyer since the magazine’s Top Lawyer list was created. Dave Ratner has been named Colorado Business Committee for the Arts’ 2019 Volunteer Attorney of the year! Today, December 4, 2018, is Colorado Gives Day! Colorado Gives Day was founded in 2011 as a way to show support for our state’s non-profit organizations, so “Give Where You Live” and give what you can to help Colorado grow! Check out Dave’s presentation at Greeley Creative District's “A Cacophony of Creatives” this past June. He discusses an overview of the legal basics for creatives including copyrights, "fair use" and protections for musicians, artists, filmmakers and other creators. 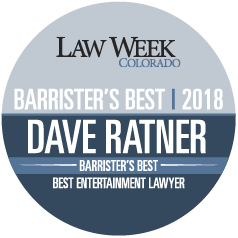 Dave Rater has been named Barrister’s Best, Barrister’s Choice “Best Entertainment Attorney” by Law Week Colorado for the second year in a row! Barrister’s Choice is based on interviews and discussions within the legal community. The Colorado Bar Association presents: The Copyright Office Speaks: The Office’s Modernization Efforts and the Music Modernization Act. The Copyright Office is in the middle of fundamentally changing how it does business to meet the modern needs of its customers and users. It is reconsidering how it functions, how it is organized, and how to adapt new technologies to its users’ needs. At the same time, Congress is in the middle of its own modernization efforts and is considering major changes to the music laws with the proposed Music Modernization Act. Copyright Office Attorney-Advisor John Riley will discuss where both Congress and the Office are in their modernization efforts, and what it means for you.